Today’s guest author is Luke Hellum. Luke is an 9th grader who has been studying geography since he was in kindergarten, making it to Arizona's state geographic bee three times, placing in the National Geographic Bee finals last year, and returning to the National Geographic Bee this year as a youth correspondent. Google is excited to sponsor this year’s event and we wish all participants the best of luck. Today, thousands of grade-school and middle-school students will compete in state-level Geographic Bees, thanks in part to Google’s sponsorship of the competitions. State and U.S. territory bee winners will advance to the national bee prelims in Washington, D.C. on May 22, and ten will be part of the final broadcast on the National Geographic Channel. Like many of these young “mapheads,” starting at the age of five, I dreamed of participating in the bee and one day making it to the finals. As a sixth grader, I reached the Arizona state competition for the first time, finishing fourth. The following year, I placed second, and although it was an improvement, I was disappointed and committed to ramping up my preparation efforts in 2011 for my final year of eligibility. I began studying rigorously again in the summer, averaging about 20 hours a week. During the fall, my mom went to Washington D.C. for an Online News Association conference and met Jesse Friedman, a Product Marketing Manager from Google. She shared with Jesse her appreciation for Google’s sponsorship of the bee, and told him that I’d been heartened by the fact that former bee competitors were now Google employees, demonstrating through their work on Google Earth and other projects that geography can have a place in my future career. I realized that the value of my knowledge wouldn’t end with the bee. Jesse wished me luck and gave my mom two stickers of the Google Maps red pin to pass along to me and my brother (who will be competing for the first time in this year’s Arizona bee). One of my study resources was a 12’ x 6’ map that covered the wall of our office. When I got the iconic pin, I decided to put it on Washington, D.C., representing my goal to reach the national bee. At times, eagerness, anxiety and restlessness would plague my study efforts. Glancing across the room at that pin would help me press on, remind me why I was working so hard, and ultimately pushed me to study harder. After many months of preparation, I won the state bee, achieved my goal of getting to Washington D.C. and placed 7th in the finals. I even got to meet Brian McClendon, Engineering VP of Google Earth and Maps. The red pin has remained a fixture on the map. It’s still on Washington D.C., as I will be returning to the bee this year as National Geographic’s youth correspondent for the bee broadcast. After that, I plan to move it around on the map as my goals shift to places I want to go in the future: New York City, where I’m moving in June and Palo Alto, where I hope to attend Stanford University someday before founding my own startup. Wherever the red pin may end up, it will continue to symbolize the confluence of my passions: geography, technology, and discovering the world. Are you similarly looking to be inspired by what you can do with geography? Watch the video below to see how individuals from a variety of fields use their geography education to pursue their passions. Editor’s Note: Today’s guest author is Luke Hellum. 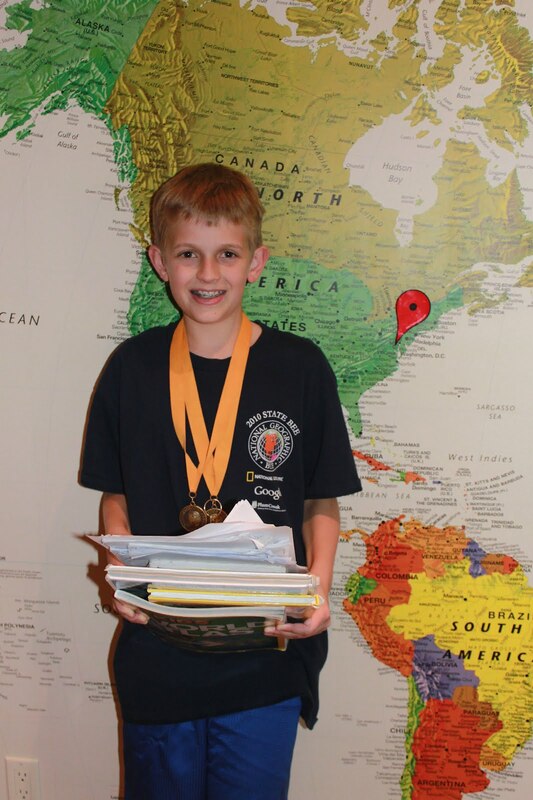 Luke is an 9th grader who has been studying geography since he was in kindergarten, making it to Arizona's state geographic bee three times, placing in the National Geographic Bee finals last year, and returning to the National Geographic Bee this year as a youth correspondent. Google is excited to sponsor this year’s event and we wish all participants the best of luck.